We can say that Angela Merkel is history alive. She is the longest-serving leader of a European Union member state. In fact, while she was Chancellor of Germany, all the other 27 member states combined had exactly 109 national leaders. That’s an average of about 4 leaders per member state. Few people should be surprised then that she has been widely considered the leader of the European Union, to the detriment of the leaders of the EU institutions. With such influence and longevity, there should be no doubt that Merkel will leave a legacy behind her not just in Germany, but in Europe and the world. In the aftermath of the Hesse state election, German Chancellor Angela Merkel finally announced what everyone believed since last year’s federal election: that this is her last term as Chancellor. By 2021, the most powerful nation in the European Union will have a new Chancellor, after a decade and a half under “Mutti”, as she was lovingly nicknamed by her fans in the 2013 election campaign. Merkel has outlasted 109 of her colleagues as heads of state or government, which is impressive longevity for European standards (but quite unsurprising for German standards, at least since 1949). Merkel’s unofficial role as the leader of the European Union has posed a significant problem for European unity. In these past 13 years, Merkel has shaped the European Union in the image that her domestic electorate preferred, often ignoring the will and the interests of the other 27 member states. When you have to make decisions for a union of half a billion people, but are electorally responsible only to 80 million German citizens, this may seem like a difficult mission. But many of Merkel’s problems resulting from this inherent conflict of power are of her own doing: in trying to reconcile her European outlook with keeping a grip on domestic politics, Merkel acted cautiously and ended up being a reactive, rather than a proactive, leader. Political pundits have analyzed the Chancellor’s policies extensively, and they reached a common conclusion: Merkel did not lead Germany; rather, she just governed it. The same could be said about Europe. It was this cautious attitude that earned her the nickname “Mutti” in the first place. She was re-elected by the German people not because she inspired them, but because she seemed to be the ‘safe bet’ in tumultuous times. Her entire legacy is shaped by this cautiousness and reactivity, from the austerity policies taken in the aftermath of the 2009 crisis, to the refugee crisis in 2015 and the lengthy negotiations in the more than 100 European Councils in which she took part. Her migration policy is an example of this. Just eight years ago, Merkel made it very clear that she believed that multiculturalism ‘had failed’. At the time, the statement was not surprising at all: she was a traditional Christian democratic leader, leading a right-wing coalition between her CDU/CSU and the conservative liberal FDP. Five years later, this time in a grand coalition (GroKo) with the Social Democrats, Merkel was the first leader in Europe to decide that all refugees would be welcome, opening Germany’s gates to one million Syrians. The result was a backlash and the growth of identitarian politics both at home and all over Europe, leading to the rise of populist right-wing “anti-Merkels” all over Europe. In domestic politics, a New York Times op-ed argues that a part of Merkel’s domestic legacy is “angry East German men fuelling the far-right”. In the country where the far-right was kept so far away from power, the nationalist AfD now polls around 15%, and has become the country’s main opposition party. Merkel’s coalition with the FDP between 2009 and 2013 marked left a lasting impact on Europe for other reasons. The German government’s handling of the Eurozone crisis produced equally substantial effects on the sentiments and livelihoods of Europeans outside the bounds of German borders. In the wake of the financial crisis of 2008, Merkel made a moralizing speech in the Bundestag regarding the fiscal irresponsibility of American profligate bankers, claiming that they should look only as far as the Swabian housewife to learn a thing or two about fiscal prudence. Just days afterwards, Merkel received word from her finance ministry that German banks had been exposed to those toxic financial assets that she had so recently lambasted. To keep the ATMs going, the German government needed to find €400B in liquidity. The Swabian housewife case wasn’t looking so compelling anymore. The first bailout of German banks was barely enough to cover the tracks of American defaults, and the banks faced a growing threat: sovereign debt from the PIIGS (Portugal, Italy, Ireland, Greece and Spain) going sour. And thus began Europe’s love affair with Austerity. To cover up for flaws of the European banking system, and a currency managed by multilateral decision making and no fiscal compliment, Europe’s most powerful country was faced with a dilemma: expose the world to the impotence of the Euro, or restore financial stability on the backs of European citizens. As it turns out, Merkel chose the latter. The design of austerity took on fundamentally flawed reason. To treat the fiscal handling of a nation state with the logic of personal finance is to ignore the dependent relationship between national income and the national savings rates. If an individual chooses to save more, they will earn no less, but saving more on a national level will only necessarily lead to a decrease in that country’s GDP. Austerity ignored this dependence between national income and saving, crippling already frail economies. This was no matter for former German finance minister Wolfgang Schäuble, who held an iron grip over the Eurogroup – the informal yet powerful body of finance ministers from each EU member state – in its meetings during the crisis. To see evidence of this fact, one might look toward Greece, Spain and Italy in the wake of the financial crisis. Each was handed down one or more bailout packages by the so called ‘troika’ of financial institutions: the European Commission, European Central Bank and International Monetary Fund. The bailout packages, motivated by Germany’s desire to shelter its private banks from bad sovereign debt, contained stringent conditions on the level of fiscal deficits for recipients. The effects of such fiscally constraining conditions have been profound. While Spain was an early adopter of Austerity policies under Rajoy’s conservative government, upon accepting the €40B troika bailout, further restrictions on government spending were imposed. Between the period of 2010-2012, the 3.5% reduction in government expenditure was accompanied by a 6.4% fall in national output. The austerity measures handed down to Greece from their first bailout in 2010 amounted to a €30B reduction in government spending, a 15% cut, followed by a 16% freefall in the Greek economy. Greece was subject to further ravaging by austerity measures upon the second EU-IMF bailout in 2012. The injection of 130 billion euros into the Greek state came with a debt write-off or ‘hairut’ to the amount of 53.5% of private Greek bondholders. The institutions that held this debt were primarily Greek pension funds and Greek banks. Whereas the latter was compensated fully, in the name of ‘financial stability’ by newfound liquidity from the bailout, masses of Greeks lost significant portions of their retirement entitlements. he bailout packages were targeted at creating the illusion of solvency in Greece by propping up dysfunctional Greek banks, and ensuring debt servicing for French and German assets. All of this came at the expense of the Greek citizen and the sustainability of Greece’s economy in the future. Despite the recent end of reliance on bailout funds this past summer, Greece still faces a debt to GDP ratio of close to 180% and an impossibly sluggish economy. The stark economic consequences of austerity are not the only outcome of Germany’s treatment of the Euro Crisis. A more insidious effect has been instilled into the psyches of debtor nations: that their political fates are now determined in Brussels and Berlin more than anywhere else. Germany has leveraged its unique hegemonic position in the fiscal arena of Europe to coerce and control at every point in Europe’s recovery from the financial crisis. The sovereign parliaments of the countries most heavily affected by austerity policies had little to no say in the remedies prescribed by Merkel and her cabinet. For all practical purposes, the German government has made political decisions that affected 500 million Europeans. Brussels might be claiming some degree of political legitimacy by the nature of its institutions: the Council is made up of all the European leaders and the Parliament is directly elected by Europeans. However, this cannot be said about Germany. The German government is elected by German citizens only, to which they are responsible. Angela Merkel was elected by the German people to lead them, but she was elected by no other European to lead Europe. She is a product primarily of German politics and little else. What most analyses of Merkel’s legacy miss is that many of these failures and shortcomings can be traced back to Merkel’s strategy in domestic politics – trying to reach across the political aisle by creating grand coalitions with the other main historic party of Germany, the Social Democrats (SPD). Three of the four Merkel cabinets were SPD-CDU grand coalitions (2005-2009; 2013-2017; 2017-present). This rapprochement with the centre-left had echoes in European politics as well: the European People’s Party of which the CDU is a branch and the Party of European Socialists started cooperating closely in matters of economic and fiscal policies at the European level. This allowed left- and right-wing populists alike to attack the national affiliates of these main European parties – and this had in turn led to a humiliating defeat for social democratic parties all over Europe. Likewise, it forced centre-right parties to move to the right in an attempt to win back supporters – Sebastian Kurz’s win in Austria being the most known case study. Grand coalitions (or national unity governments, for that matter) can be very good solutions to moments of unprecedented crisis, when parties opposed ideologically pool their intellectual and political resources in order to overcome such moments of great urgency for a nation. They are necessary in times of war, catastrophe, or upheaval. But, apart maybe from the moment of the European sovereign debt crisis, Germany did not face such imminent threats that require a grand coalition. By using this instrument when not needed, the most important effect was that the CDU and the SPD moved closer to one another – both towards the political centre – and the idea that they presented different perspectives on German society lost its credibility. This move towards one another had different dimensions for each party: while the SPD moved to the right on economic policy, accepting the zero deficit policy and the fiscal conservatism of the CDU, the Christian Democrats moved to the left socially, adopting pro-immigrant policies, supporting the abolition of military service, and gay marriage. The latest polls, which put the CDU/CSU at 25%, and SPD crushed at an abysmal 13%, are clear proof of this shift in German public opinion. For most of the Federal Republic’s history, CDU had a quasi-monopoly on the right, while SPD was the left par excellence. In 2018, the FDP and the AfD (the other right-wing parties) have between them about the same percentage as CDU. As for poor SPD, they have become a secondary party of the left themselves, with the Greens having almost twice as much as they do. Along with the far-left Die Linke, the proportion between the ex-secondary left and the SPD rises to almost 3:1. 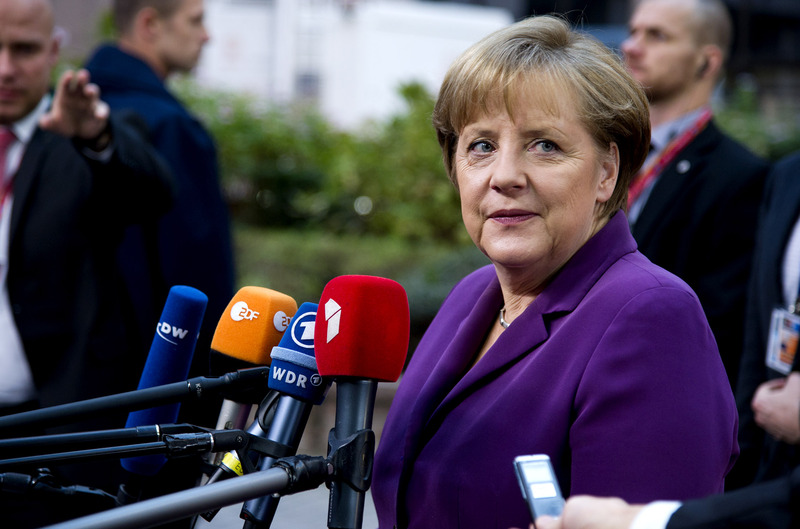 The legacy of Merkel is ultimately a legacy of German interests prevailing over the wider European interest in the past decade of European politics. It is a legacy made by Germany for Germany; one that severely affected public trust and perceptions of democratic legitimacy of the European Union. Feature image by European Council, via Flickr Creative Commons. Note that the information and statistics regarding the Eurozone Crisis are taken largely from chapter 2 of former Greek Finance minister Yanis Varoufakis’s memoir, Adults in the Room. We urge anyone looking to verify the information contained within this article or anyone who is interested in learning more about the negotiations behind the the Crisis to consult this source.